Concerned about the new laser systems coming to Australia? Don't be! We have a solution. 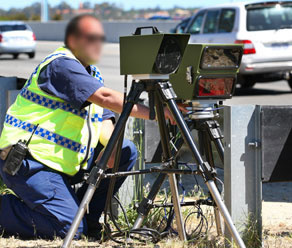 Vitronic Poliscan Laser Camera - Replacing old radar cameras - NOW IN WA, VIC, NSW AND QLD! After receiving countless emails and phone calls regarding the new laser camera system being rolled out we wanted you to get some of the right facts about these new systems. 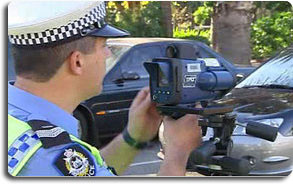 Yes, the police have started rolling out the new Vitronic Poliscan mobile cameras. Yes, these new cameras will operate on laser instead of the old radar technology that was used with multanova cameras. Yes, these new cameras will scan across 4 lanes of traffic simultaneously, taking front and rear photos. Sometimes radar detectors can detect the cameras but the detection range will be inconsistent and usually it will be too late to react to the alert. LTi TruCam - Laser Gun + Video Recorder in One, Watch Out! The other system our customers have been enquiring a lot about is the new Lti TruCam laser gun and how it will be used in Australia. The LTi TruCam allows police to take a digital video of a vehicle speeding and records it in the gun as "evidence". This means that the police could be distancing themselves even further from enforcing the law because this gun would allow them to hide in even sneakier spots then simply mail you a fine when you may not have known you have ever been done! 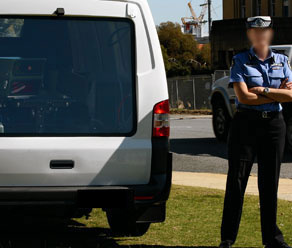 LTI TruCam in use by police officer. REMEMBER: The ALPriority is a laser based parking sensor and is 100% LEGAL to use in all states. The new Poliscan transmits it's laser on a VPR (variable pulse rate). 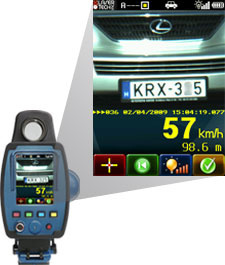 The ALPriority has already been proven in by us and our customers that it works against the new Poliscan laser cameras. Contact us today to discuss how the ALPriority can help protect you against these new systems! *Installation of the ALPriority is available in Western Australia.